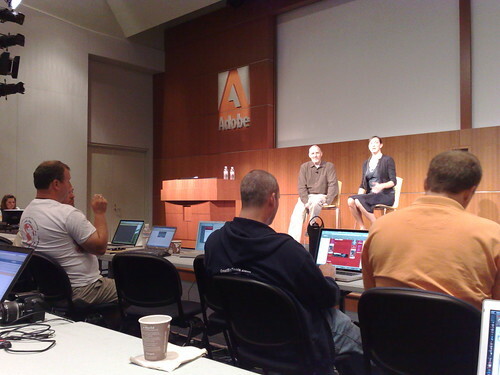 I’m finally back home from a fantastic week in San Jose at the Adobe Summer Institute. The Summer Institute is a 5 day conference/workshop event run by Adobe’s Education division for members of their global Adobe Education Leaders program. I was inducted into the AEL program last year but was unable to attend the 2008 event in San Francisco. This year I was determined to attend the San Jose event and I’m really glad I went. When you do in fact know a fair bit about technology and how to use it, it becomes harder to find professional development experiences that challenge and extend you. One of the reasons I was so keen to attend the Summer Institute was that I felt it would push me to learn more and build on some of the knowledge I already have. Having been a Photoshop user for many years, and spending many hours inside programs like InDesign (and PageMaker before that) and having taught Flash and Dreamweaver to students, I’ve always been quite immersed in Adobe’s Creative Suite, but the nature of these tools always seems to be such that the more you know about them, the more you realise you don’t know. The other AELs came mainly from all over the US, with quite a few from the UK and a handful from other places like New Zealand, Hong Kong and Belgium. I was the only Aussie. We started the week on Monday evening with a Welcome Party at our hotel where we got to meet the other AELS and some of the folk from Adobe. It was good to meet new people and make new connections. Tuesday started early for me with a Photoshop exam. This was taken as part of the Adobe Certified Associate, a recognised certification for Photoshop users. Happily, I passed the exam without too much trouble. The rest of Tuesday was filled with meeting with the Adobe product teams, where we got to hear about future product roadmaps, learn about upcoming features and directions for the Creative Suite, and to offer suggestions for how we thought the products could be improved. Parts of the day were done under NDA so I can’t really go into details, but suffice to say there will be plenty of exciting new stuff coming from Adobe in the next year or two. Dinner that night was held at Saratoga Springs, a lovely camping ground in the hills surrounding Silicon Valley, and we had fun and games with some hilarious variations on team volleyball played with water-filled balloons. Wednesday was filled with AEL to AEL sessions – workshops where we presented to each other many of the things we were doing in our own schools and districts. Watching these sessions, it really struck me what an intensely creative and passionate group of educators this was. Although not everything was directly relevant to my own teaching situation, I still got tons of great ideas from the sharing that took place. Collaborative projects, experimental ideas based on art, design and creativity, ideas for streamlining school administration, examples of how teachers do things in other parts of the world… we got all sorts of cool ideas from these AEL sessions. After a full day of learning from each other, we regrouped in the Adobe Cafeteria for a delicious dinner and drinks, where more sharing and conversation took place in a relaxed casual atmosphere. I was quite amazed as we watched the planes fly over the Adobe building, which was directly in the landing path of San Jose airport, seeming to clear the top of the building with only a few hundred feet to spare. A few of us kicked on to a bar in downtown San Jose where the conversations continued into the night, only louder. Thursday was another full day of learning, with a intense session run by Adobe’s John Schuman. We learned many of the very cool features in the software tools, and in particular how to make them work together smoothly. Our project required us to integrate our work across Photoshop, Dreamweaver, Flash, Fireworks, InDesign and Bridge as we roundtripped files between the various tools. In each of the applications we discovered lots of useful workflows and there were quite a few new concepts that I hadn’t come across before. The last part of the day took us into a project using Flash Catalyst, a relatively new product still in beta, that makes it much easier for designers to create interactive content. I’m still getting my head around Catalyst, but it looks like a great tool for rapidly designing interactive media without the need to know heavy-duty coding stuff. Thursday night was good fun, with a night out to a local San Jose pool hall. By this stage we had gotten to know each other a little better, so it was cool to hang out, shoot some pool and have still more conversations about learning and life. The night finished while it was still young, as the pool tables were reclaimed at the stroke of 9:00pm. A few of us wandered across the road to another party that looked like it would be fun. I turned out to be an Open Source party, sponsored by Source Forge. With free drinks (free as in “beer” – I thought that was hilarious at an Open Source event), tatoos getting done in the basement (no, I didn’t get one), as well as Twitter stations, free T-shirt giveaways from the good folk at ThinkGeek, guys playing with Star Wars light sabres, people wearing infra-red night vision goggles, etc, it was a truly geeky event… I loved it! Friday morning was the last day of the conference and I’d arranged to do another certification exam, this time in Dreamweaver. Although I’ve used Dreamweaver a lot in the past, I hadn’t used it much lately so wasn’t feeling too confident in my ability to pass this exam. However, I did pass, and since I had a bit of time to spare at the end I decided to have a crack at the remaining exam for Flash. This one I really wasn’t too confident about, since I haven’t used Flash much in the last 12 months and there are some big changes to the CS4 version. Even so, I surprised myself by passing the Flash exam too, so I was feeling pretty pleased that I managed to get my certification in Photoshop, Dreamweaver and Flash all in the same week. The rest of Friday morning was a general wrap up of the event, with feedback and a debriefing session between the AELs and the Adobe folk. It was kind of sad to have it all come to an end, but we eventually said our goodbyes and all went our separate ways. The sessions were all recorded with Adobe Connect, as well as a ton of Twitter, Flickr and Delicious resources all tagged with ael09, so at least there is a decent electronic record of the sessions. I didn’t have to be at the airport until quite late so myself and Saiqa, another AEL from London, decided to rent a car and do some Silicon Valley sightseeing. We dropped in on the headquarters of Apple and Google, then headed in to San Francisco for some last minute sightseeing around Fisherman’s Wharf before getting back to SFO airport for our late flights. Overall, a great week and one I’d be keen to do again. Thanks Adobe for running and hosting the event, especially to Megan Stewart and her team who did a great job of making sure the program went off perfectly. Great conference, can’t wait to get back next year! 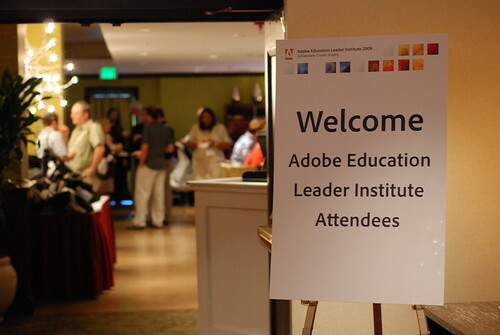 The Adobe Summer Institute Wrapup by Chris Betcher is licensed under a Creative Commons Attribution-ShareAlike 4.0 International License. I was thinking of you the whole week. I knew you would get a lot out of it. Adobe do look after their AEL well.